Yuval Noah Harari, author of the critically acclaimed New York Times bestseller and international phenomenon Sapiens, returns with an equally original, compelling, and provocative book, turning his focus toward humanity's future and our quest to upgrade humans into gods. Over the past century, humankind has managed to do the impossible: turn the uncontrollable forces of nature--namely famine, plague, and war--into manageable challenges. Today more people die from eating too much than from eating too little; more people die from old age than from infectious diseases; and more people commit suicide than are killed by soldiers, terrorists, and criminals combined. We are the only species in earth's long history that has single-handedly changed the entire planet, and we no longer expect any higher being to mold our destinies for us. What then will replace famine, plague, and war at the top of the human agenda? What destinies will we set for ourselves, and which quests will we undertake? Homo Deus explores the projects, dreams, and nightmares that will shape the twenty-first century, from overcoming death to creating artificial life. But the pursuit of these very goals may ultimately render most human beings superfluous. So where do we go from here? And how can we protect this fragile world from our own destructive powers? We cannot stop the march of history, but we can influence its direction. The main products of the twenty-first-century economy will not be textiles, vehicles, and weapons but bodies, brains, and minds.While the Industrial Revolution created the working class, the next big revolution will create the useless class.The way humans have treated animals is a good indicator for how upgraded humans will treat us.Democracy and the free market will both collapse once Google and Facebook know us better than we know ourselves, and authority will shift from individual humans to networked algorithms.Humans won't fight machines; they will merge with them. We are heading toward marriage rather than war. This is the shape of the new world, and the gap between those who get on board and those left behind will be larger than the gap between industrial empires and agrarian tribes, larger even than the gap between Sapiens and Neanderthals. This is the next stage of evolution. 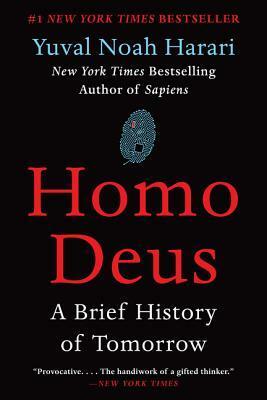 This is Homo Deus.